Do you remember the year 1999? Where did you experience the „Total Solar Eclipse“ at that time? It is a unique effect when the sun disappears during the day, only a blue-white ring of rays remains visible in the otherwise dark sky for several minutes and all surroundings are illuminated by the characteristic colors of the sunset. No one is likely to ever forget this natural spectacle. Such a „Total Solar Eclipse“ (– this means full coverage of the solar disc by the moon -) is very rare, it happens only approximately once per year somewhere on Earth and only on a small band with max. 50km width. “Total Eclipses” happen only approx. every 300 years in the same location – the next “Total Eclipse” in Europe will take place in the year 2081. This means that most people experience it only once in their lifetime. But apart from total eclipses, Sun and Moon also provide the show of a “Partial Solar Eclipse”: the moon covers a part of the sun. This is also highly impressive – but this phenomenon can only be seen with solar viewers or AstroSolar® products! A very small crescent sun on March 20th all over Europe. Friday, March 20th, 2015 during morning. Kids are at school, people at work. All of a sudden the daylight becomes noticeably weaker, all colors become soft. Whenever the sky is clear, you will still see the Sun, but notice that it seems somehow different. Less bright, smaller, as if it were dimmed to a lower level. Nature looks totally changed, everything seems pale and dusky. But the weirdest thing is the shadows of the tree branches: Instead of normal shaped “dots of light” between the shadows from the branches you see “crescents”! The reason for all these phenomena is that the Moon is obstructing the sun and covers more than 70% of it. The further north in Europe you are observing this spectacle, the more area of the solar disc is obstructed by the moon. Northern European countries will even experience a coverage of over 80% – it means that just a small crescent of the Sun will remain visible – but you need a solar viewer still, to stare straight into the still incredibly powerful Sun. NOTICE: Special protection to the eyes is an essential requirement to observe the sun as a crescent. DO NOT RUIN YOUR EYESIGHT BY LOOKING INTO THE SUN WITH UNAIDED EYES! The eclipse will be most impressive in the northern european countries (Norway, Sweden, Finland, baltic republics) as well as in england, where the sun is almost fully covered. Likewise in the darkness zone is eastern europe including Russia, as well as most western european countries such as Italy, France and Spain. The totale solar eclipse will be 430km long but only a couple of kilometers wide and mainly be visible over the sea. Only on a view small islands such as Faroe Islands and Spitsbergen the totality zone will hit ground..
Be prepared for the solar eclipse! Ideally suited are our Solar Viewers as well as AstroSolar® Safety Film and our new Baader Solar Filters! 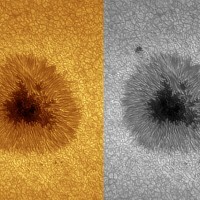 Posted in AstroSolar.com News and tagged partielle Phase, Solar Eclipse.